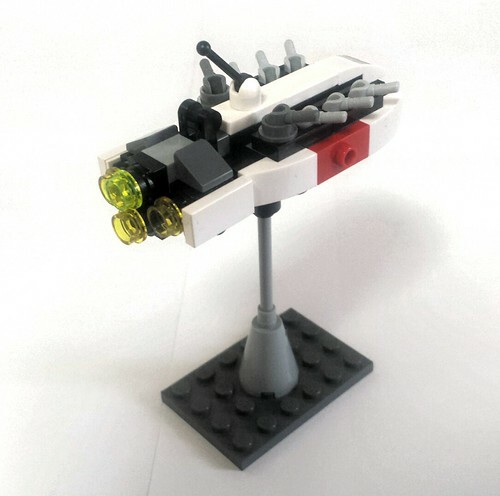 A shuttle or transport ship for the "NASA industrial" fleet I've been messing around with. 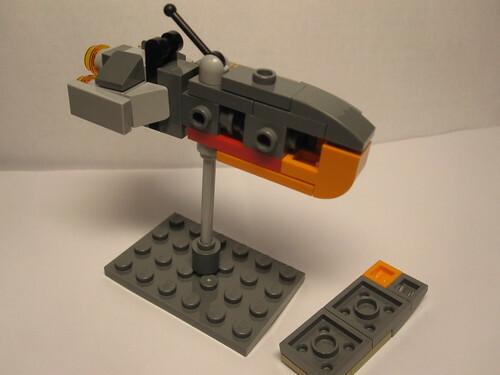 Possibly a small frigate, or maybe an HVA; I'm not sure yet. 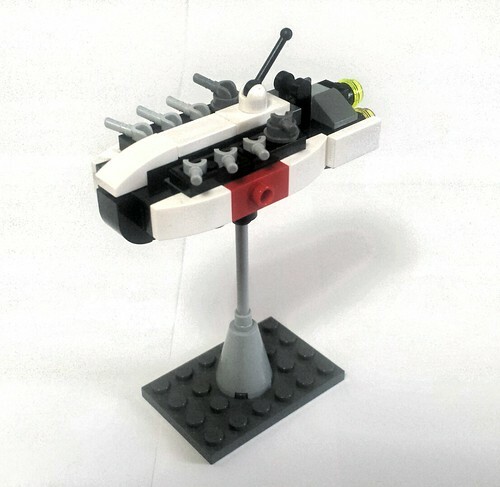 The core of this ship is pretty fragile, as the tiles along the top of the "spine" are barely held in place with a trio of technic half-pins. Bricks with studs on their sides hold technic pins much more loosely than regular bricks due to the holes in them, and that sloped brick doesn't hold them well either. I have no idea how to get the curved brick in front to be upside down though. 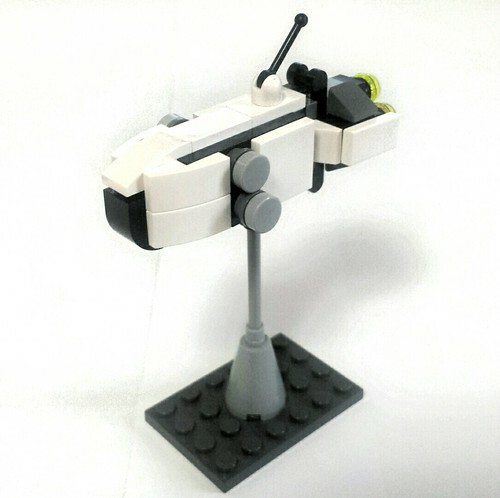 I tried putting a pair of 1x1 round brick "cargo cannisters" on the side, similar to the Libra frigate, but they were too big. Maybe if I built them with 1x1 round plates instead of the 1x1 round bricks. 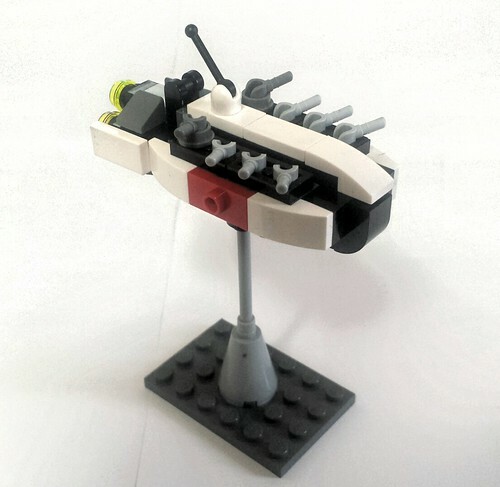 The name was suggested by charonlarp for the ship that became the Libra, but I thought it fit here. Last edited by HyveMynd on Sat Apr 11, 2015 9:50 am, edited 1 time in total. So I made a variant based around Cakes idea for the core, and added a ventral BFG while bulking it up just a touch. 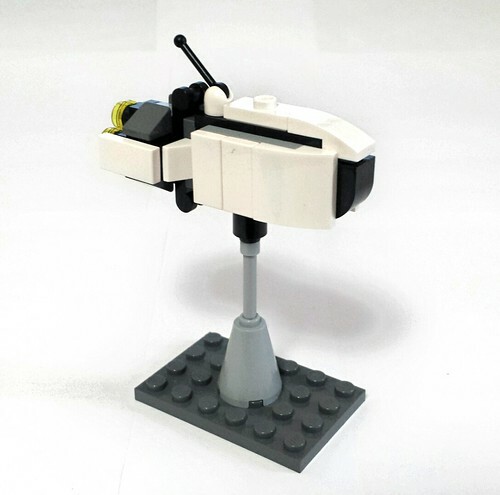 This is a really neat little ship, and I love your IO designs. I guess we can call it the Lucha Libra? I think you just made a Zerovirus gun. Now I want to go home and build one of these. Aw dude! 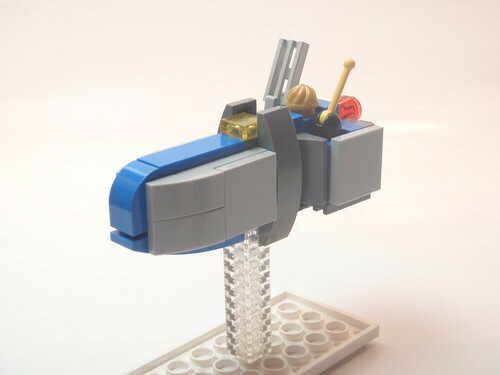 I'd been wracking my brain trying to figure out how to use travis bricks for the core while not having their studs interfere with the placement of the curved brick for the prow. THAT'S IT! Awesome! Now I don't have to use half pins to hold the top in place, leading to that unsightly gap. Doe the updated 'two travis brick + two 1x1 plate' core hold the 2x3 plate siding? Or does it only hold 2x4 plate siding? 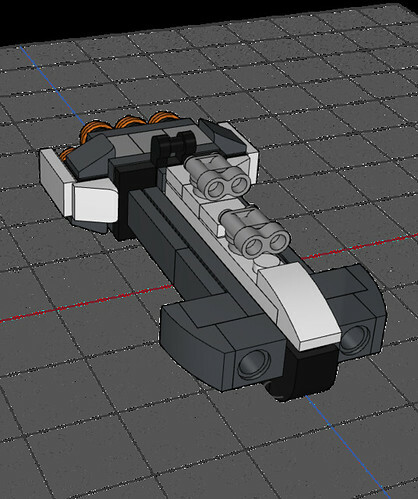 While trying to rebuild the core I was also trying to find a place for weapon mounts (MF0:IO is a tabletop wargame after all) and thought the ship might need a bit more length. FragsturBait wrote: So I made a variant based around Cakes idea for the core, and added a ventral BFG while bulking it up just a touch. 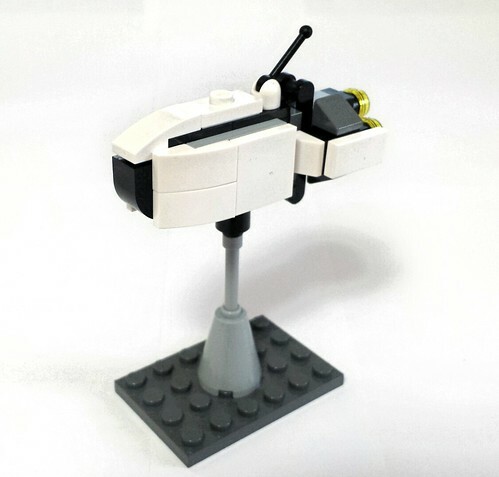 This is a really neat little ship, and I love your IO designs. I guess we can call it the Lucha Libra? What does that look like flipped upside down FragsturBait? 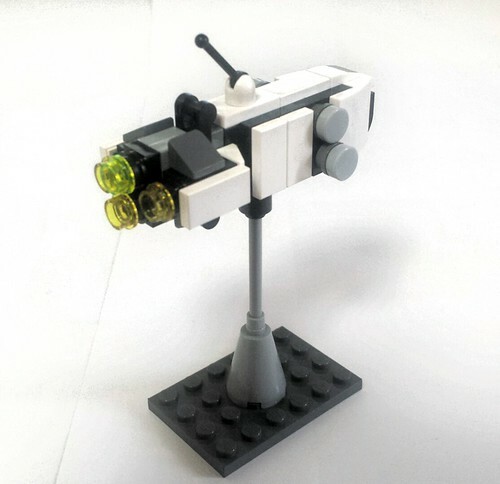 Done up in black or dark grey, those headlight bricks look like the greebly bits found on the underside of a ship to me. 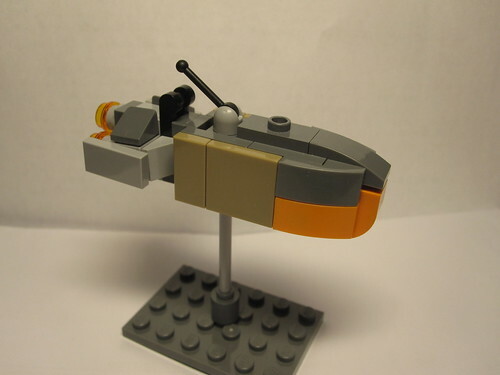 Speaking of, I think the ship would look awesome in dark grey with a yellow or red underbelly. Very Spacebattleship Yamato. HyveMynd wrote: Aw dude! 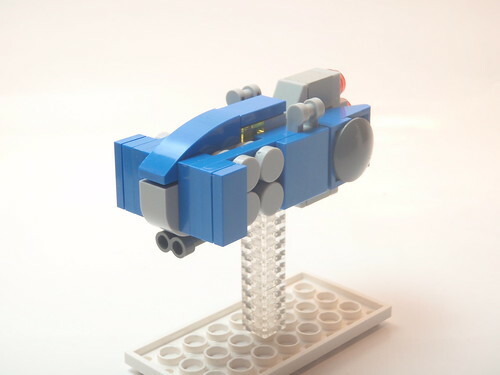 I'd been wracking my brain trying to figure out how to use travis bricks for the core while not having their studs interfere with the placement of the curved brick for the prow. THAT'S IT! Awesome! Now I don't have to use half pins to hold the top in place, leading to that unsightly gap. There is still a small gap right at the front of the ship, which I couldn't figure out how to fill, but is really small so isn't that unsightly - it can be just seen in the images I've linked. 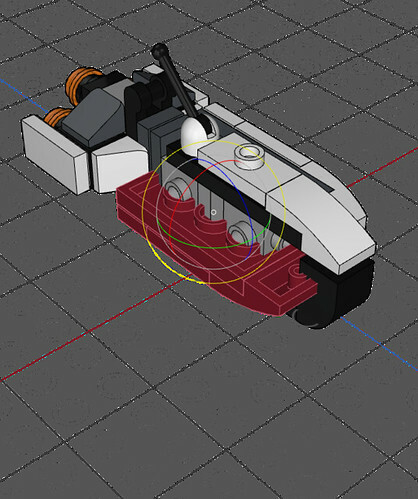 The model I built felt very solid too, thought the lower bowed brick is a bit fragile - adding another couple of 1x1 plates might help by wedging it in place (have a look at the bottom image, the bits are in red). 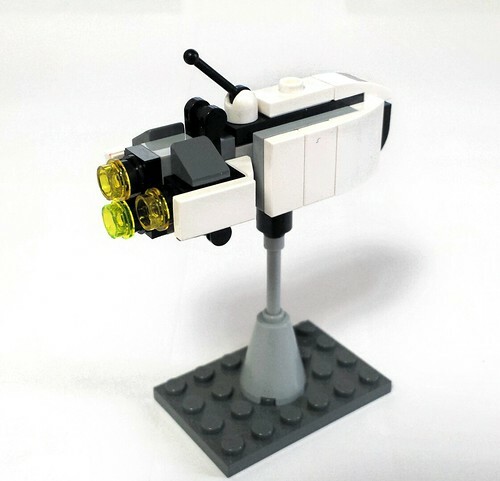 Thanks for doing up those awesome LDD models. I was thinking about a larger version too. I'm going to try a 1x4 Technic brick in place of the 2x4 plate for each side. Placed horizontally, you could put three minifig hands into the holes along both the top and the bottom. Presto! Weapon batteries. Another nice design, I look forward to seeing this fleet completed! 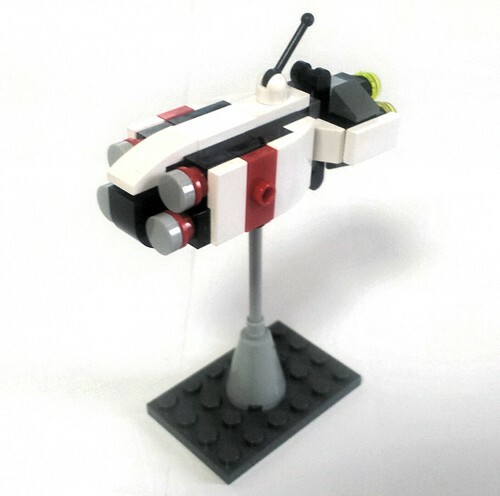 Thanks to Cake, the ORT-07 Nimbus got an update. It's sturdier, holds together better, and is a bit longer. I also built a few variants, as the fleet will need some protection. 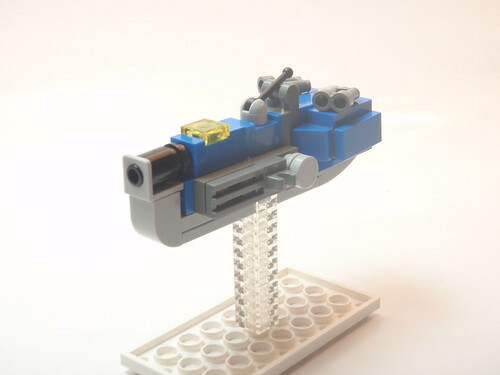 Instead of the 2x4 plates for the sides, I used a 1x4 technic brick as the base for the gun deck. Two 1x2 jumper plates went into the two outermost holes on the top (and three 1x1 round plates went into the holes on the bottom, though you can't see them). The guns are minifig hands (I had quite a few after buying those Legend of Chima battle packs), though I only had six in light grey. 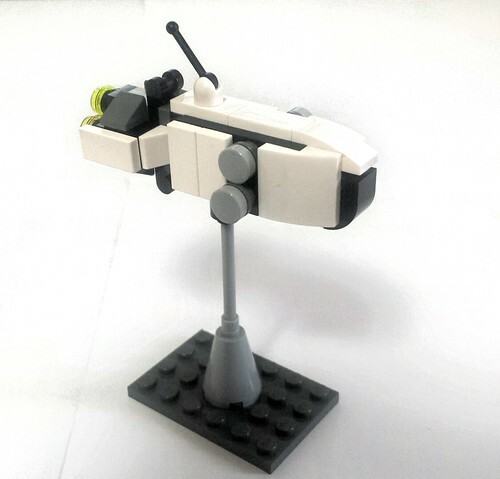 I tried white initially, but they didn't look like weapons when they were the same color as the ship. The dark grey 1x1 round plate at the back was just to make the dark grey gun look intentional. 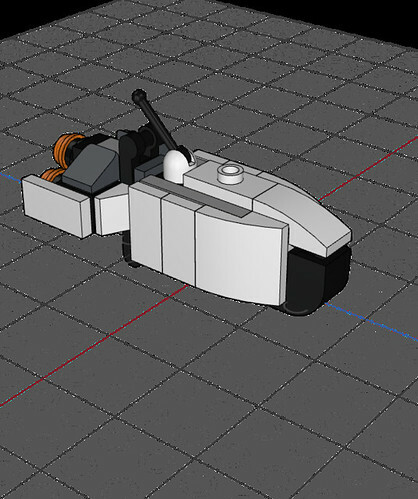 The gun deck is longer than the siding on the 07 Nimbus, so I had to remove the 1x1 plate and cheese wedge from the engines.I filled out the space between the 1x2 curves and the body with 1x1 plates. 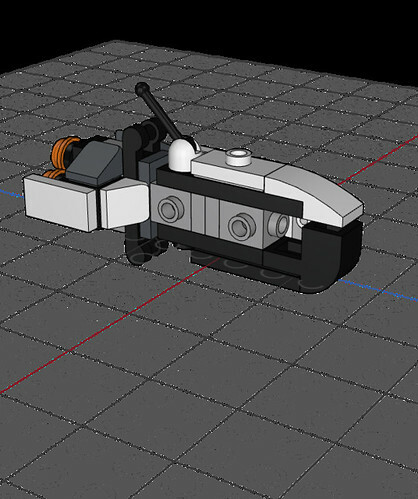 If I had more minifig hands, I suppose I could have a lower deck gun battery as well. 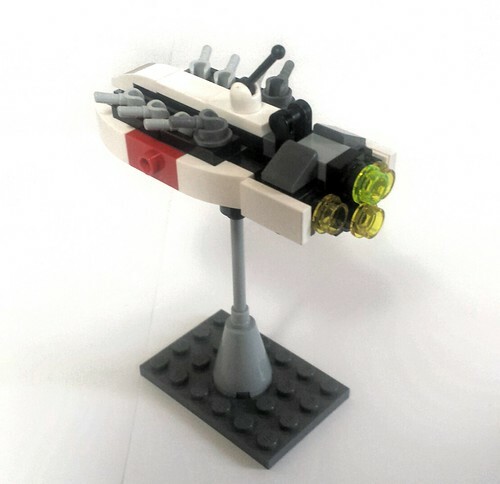 I found a bunch of 2x2 plates with two studs along one side while building the gunboat and they became the missile launchers. It's essentially the 2x4 plate siding of the standard Nimbus, but with the curved brick facing the stern of the vessel and an additional plate of thickness. I don't have the 1x1 round tiles in any color other than light grey, so I try to identify missiles and rockets with a colored 1x1 round plate. I've done that with the four anti-ship missiles here. 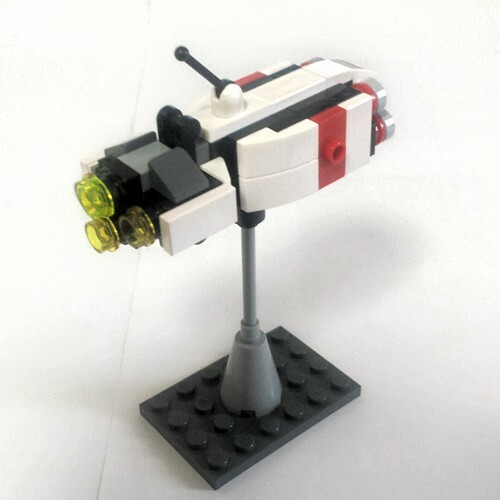 That missile frigate is too sweet. 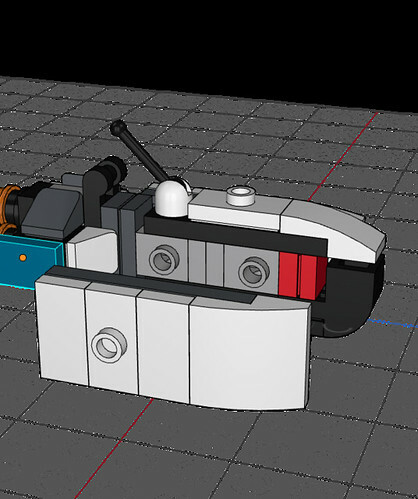 I was trying to figure out how to blend the 1x4 Technic Brick into the hull for the ORT-08 Nimbus Mk II Gunboat over the weekend - hadn't thought of doing something so simple - it looks good. 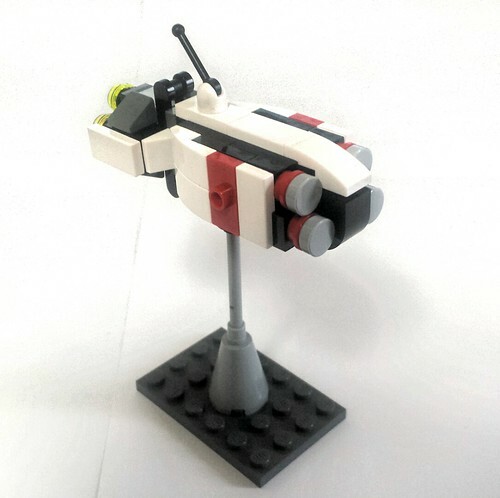 This little ship is very impressive! I love how modular it is. You've been killing it lately HyveMynd! Great stuff! Thanks guys! 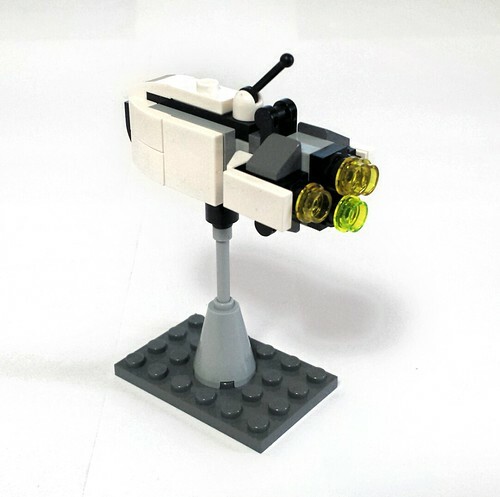 I'm having a blast building these things (though I need to place a BrickLink order so I can have more than one together at a time), and I'm glad people like them. Big, big kudos to Cake for solving that core issue. 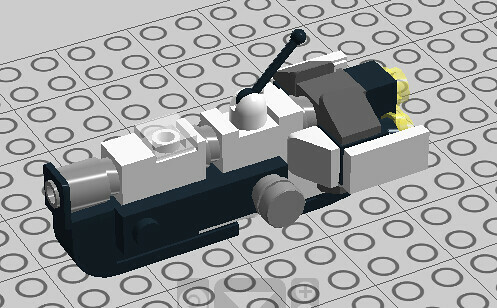 I'm working on some smaller transport ships that will be used as HVAs, so the Nimbus is being upgraded to a destroyer. I don't have too much to add beyond what's already been said, but I really like what you're doing with this whole line. Thanks guys. You've all been a tremendous help. 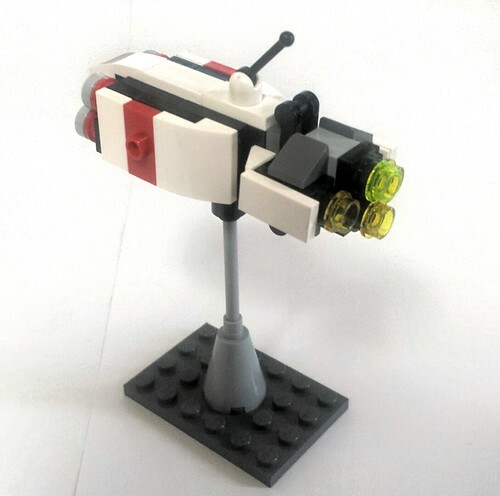 I need to put in a BrickLink order eventually, as I can only have one ship together at a time. Finally got around to taking some pictures. I've settled on 3 variants that I really like after quite a bit of tinkering. 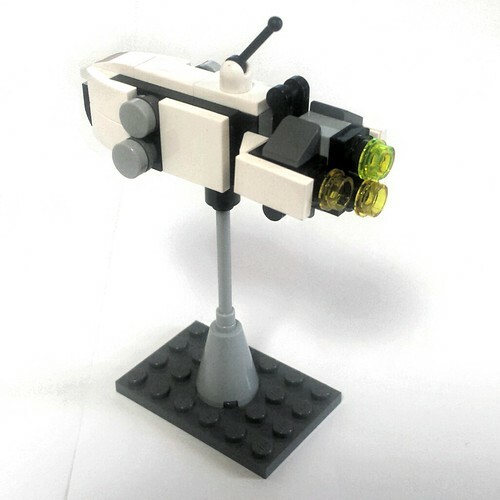 Second, the big blocky support variant, with long range weapons and high tech type fluff. Last is the obligatory "this almost looks better upside down" scout/spy variant. Have I mentioned how much I love this thing? I absolutely love that 'Hammerhead' variant. Very slick. And that asymmetrical control island is sweet. Awesome color scheme, too. Very, very nice. FragsturBait wrote: Finally got around to taking some pictures. I've settled on 3 variants that I really like after quite a bit of tinkering.